A handful of sellers at One57 have taken losses, but that hasn’t deterred the owner of an 80th floor apartment that was listed today asking an optimistic $60 million. 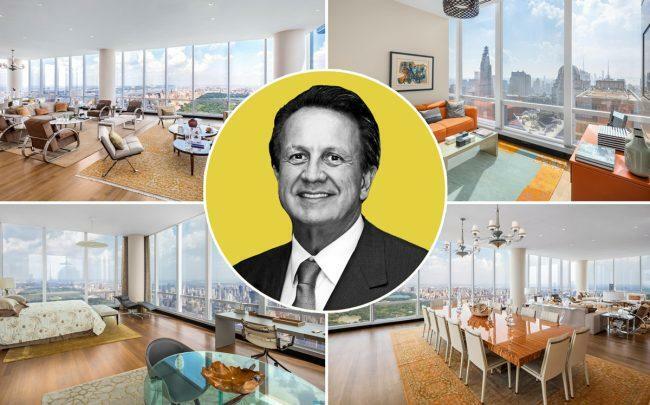 Edson de Godoy Bueno, who was Brazil’s richest healthcare billionaire, bought the roughly 6,250-square-foot apartment at Extell Development’s 157 West 57th Street for $53 million four years ago. It once held the distinction of being New York’s most expensive non-hotel rental, asking $125,000 a month. The unit, owned by his estate, is now priced at $9,615 per square foot on the sales market. The apartment has four bedrooms with ensuite bathrooms, floor-to-ceiling windows and views of Central Park, the Hudson and the East River. Amenities at the supertall skyscraper include a swimming pool, a spa, a fitness center, a library, and a private screening room. The resale will have to compete with discounted sponsor units still available at the building. The priciest sponsor unit currently being listed is a $28.5 million five bedroom unit on the building’s 41st floor. The unit will also have to compete with new product at 520 Park, 111 West 57th Street and Extell’s own Central Park Tower, the most expensive condo project in city history. Other sellers at One57 have taken hits on apartments they bought at the height of the luxury boom. In May, Canadian billionaire Lawrence Stroll sold his apartment for $54 million, less than the $55.6 million he paid four years earlier. And another investor paid $32 million for a pad on the 32nd floor that eventually resold for $21.4 million. Bueno bought the unit now being listed for $60 million through an anonymous LLC called Lapus NY, Inc. Another LLC linked to Bueno also bought unit 40D at One57 for $3.3 million in the same month. It was listed for sale at $3.5 million in 2017, but was taken off the market. Bueno died of a heart attack in 2017 while playing tennis at his mansion in Rio de Janeiro, in the midst of negotiations to sell nine hospitals to UnitedHealth. Before his death, the doctor-turned-business magnate sold a 90 percent stake in his insurance and hospital company, Amil, to UnitedHealth for $4.9 billion in 2012, becoming the health care giant’s largest individual shareholder and its chairman for Latin America. Bueno also owned controlling shares in Dasa, Latin America’s largest chain of medical diagnostic laboratories. His son Pedro became CEO of Dasa in 2015 at the age of 24, making him Brazil’s youngest CEO at the time. Pedro Bueno stepped down from that role this January.